Risotto is a bit of a go-to for me. I like the whole one-pot thing it’s got going on, and I also find its gooey deliciousness indulging and comforting. 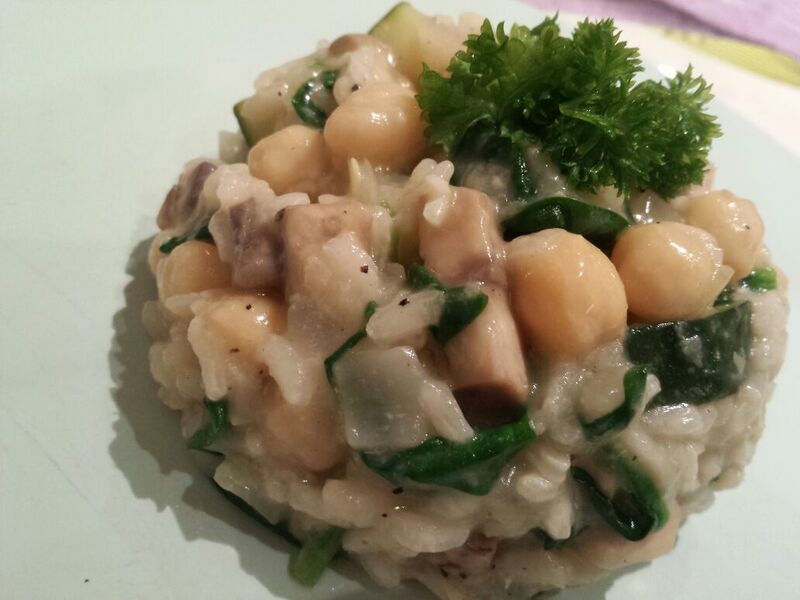 Risotto is also easy to adapt by adding different vegetables and ingredients. This particular recipe is often one I use when I’ve forgotten to get meat out of the freezer, or one for meat free Monday! 1. Heat the butter over a low heat in a large saucepan big enough to hold all of the ingredients. Add the chopped onion, garlic, oregano and seasoning. Stir the onions and keep cooking them till they become translucent, don’t let the garlic burn. 2. Add in the risotto rice and allow the grains to heat up slightly. Then, pour in the white wine. It will sizzle and smell amazing. 3. Let the rice take up the white wine, and when it is all absorbed add a small amount of the stock. This is where the continuous stirring comes in. Little stock, stir, let rice absorb, stock, stir, absorb…..
5. For the final few minutes, add the spinach and allow it to wilt into the risotto before stirring in. I like to add a little lemon zest here too but that’s optional!